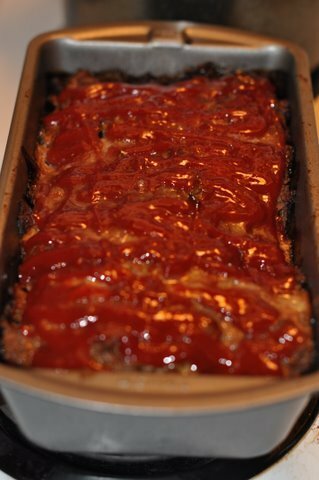 A classic meatloaf is one of my husbands most favorite dishes. This recipe is from my Mom. We make a few adjustments every time we make it, but it is so juicy and is great the next day as a sandwich. 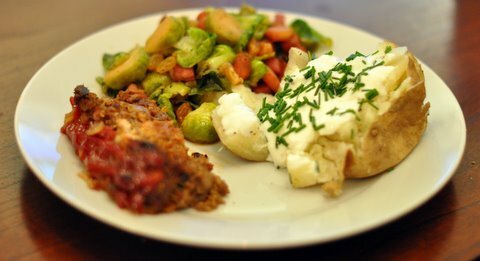 The Brussels sprouts are truly delicious. I know that some of you probably don’t care for this veggie, however if you try these…I guarantee you will have a different opinion. 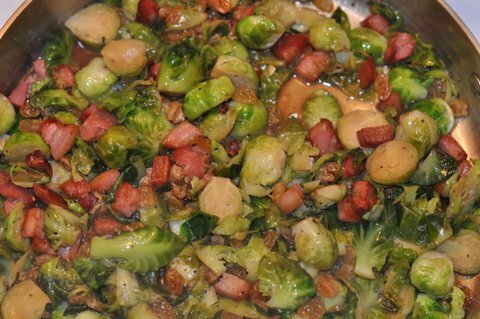 The pancetta is mixed with the raisins and broth, almost caramelizing the sprouts. Fantastic. -Preheat oven to 350 degrees. In a medium sauce pan on medium heat, cook onions, olive oil, salt, pepper and thyme until onions are translucent, 15min. Add Worcestershire sauce, stock, tomato paste. Mix well. Let pan cool to room temperature. Combine meat, bread crumbs, eggs and onion mixture in a large bowl. Mix well and shape into a rectangular loaf pan. Spread ketchup evenly over the top. Bake for 1 hour until the internal temperature is 160 degrees. Enjoy! -Heat olive oil in a 12in saute pan. Add the pancetta and cook stirring often until the pancetta is golden brown, 5-10 minutes. Remove pancetta and place on a plate lined with paper towel. 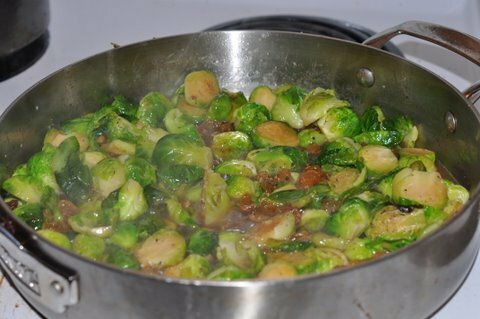 -Add brussels sprouts, salt and pepper to the fat in the pan and saute over medium heat for 5 minutes, until lightly browned. Add the raisins and chicken stock. Lower the heat and cook uncvered, stirring occasionally, until the sprouts are tender, about 15 minutes. If the skillet becomes dry, add more chicken stock or water. Return the pancetta to the pan, heat through, season to taste. Enjoy!